A famous name, this Tootsie Pop Pail Table-Top Merchandising provides the added incentive of low 15c price. And if positioned where kids can get at it, the galvanized pail concept is a cheap source of ongoing sales. Particularly if the parents are’t watching the kids too closely. This rural pail more the retailers outfitting than anything provided by the lollipop maker. 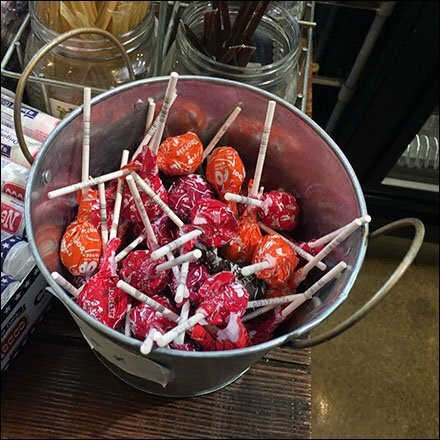 This cute and effective Tootsie Pop Pail Table-Top Merchandising seen at the onsite store of The Lands at Hillside Farms, a non-profit, educational farmstead teaching sustainable life choices, Shavertown PA.